Students can work with faculty to design installations in the museum’s Academic Focus Gallery relevant to their courses. The gallery is located on the main floor near the University Classroom. Below is a list of installations from 2011 through 2016. The works that were on display (from a wide range of times and cultures) highlighted the portrayal of the human figure in art and made objects, and probed the boundary between things and humans. The works were organized into three overlapping thematic groupings: sacred objects, effigies, and functional objects. This installation was organized by Kati Henderson as part of her master’s project, “Ambiguously Human,” which considered the ways different disciplines, from visual art and philosophy to biology and computer science, define what is human as opposed to what is an object. The works chosen for this installation reflected choices made by three Duke faculty members for use by their students over the course of the Fall 2015 semester. Professor Elvira Vilches of Romance Studies was teaching a course, “Nature, Body, Mind: Chocolate and Tobacco in the Hispanic World and Beyond,” and the works selected for her course related to the production and serving of cacao in the ancient Americas. Three archaeology courses focused on the ancient Mediterranean collection: “Classical Greek Archaeology” (art history professor Timothy Shea) and “Principles of Archaeology and the Archaeology of Death: Ritual and Social Structure in the Roman World”(classical studies professor Alicia Jimenez). Students in each of these courses were assigned to closely observe the objects, prepare detailed descriptions of them and write papers that provide context for them in the ancient world. This installation was inspired by Alison Bechdel’s graphic novel Fun Home: A Family Tragicomic (2006), the 2015 Common Experience summer reading book for incoming first-year students at Duke. The works that were on display reflected themes found throughout Fun Home, including family, death, gender, sexuality, feminism, and identity. Members of the Duke community from a variety of academic and administrative departments have offered their personal reflections on some of the works. Their thoughts are shared in the this PDF. Merging the genres of comics and memoir, Fun Home follows Bechdel’s fraught relationship with her father, an English teacher and director of a small-town Pennsylvania funeral home. Alison and her family call the funeral home “Fun Home.” As a child, Alison struggles against expectations of how girls should dress and act. In college, she comes out as a lesbian. Shortly after telling her parents, her father is killed by a truck, and Alison discovers that he was a closeted gay man. She must then re-evaluate who she understood her father to be. Richard Anuszkiewicz, Untitled from the portfolio Inward Eye, 1970. Published by Aquarius Press, Baltimore, Maryland. Printed by Edition Domberger, Stuttgart, Germany. Screenprint on paper. Edition 108/510. Collection of the Nasher Museum of Art at Duke University. 1997.17.2.2 Gift of Ramona Morgan. You trust your eyes to give an accurate representation of the world, but are the colors you see truly there? Color is often regarded as a physical property. However, the instability and relativity of color cannot be chalked up to the workings of wavelength and light. The eye and brain define our experience of color. Artists and scientists have been fascinated and perplexed by the visual and neural mechanisms contributing to visual perception. Their collaborative efforts have explained and contextualized visual phenomena. French chemist Michel Chevreul’s theory of simultaneous contrast and optical mixing informed the work of impressionist and symbolist artists. Josef Albers’ empirical approach to understanding color phenomena taught modern and op-artists new ways to apply color theory. This mutual curiosity in the existence and interactions of color culminated to inform why we see what we see. Seeing Color brought together artists whose works explored and exploited the neural mechanisms of the eye and brain. Spanning from 1920 to 2007, the art featured in this exhibit investigated the intersection between art and neuroscience, with an emphasis on color and luminance. Some works asked the viewer to confront the instability of visual perception. Others challenged one to accept colors not physically present. Do you trust what you see? Henry Elinson, De Kooning. American; Russian, 1995 - 1996. Pastel on paper. 50 x 38 inches (127 x 96.5 cm) 1996.22.22. Collection of the Nasher Museum of Art at Duke University. Gift of Henry and Ludmila Elinson. This installation was organized by Professor Pamela Kachurin’s fall 2014 class, “Soviet Art after Stalin.” Highlighting works by Russian artists both in the Soviet Union and abroad, Soviet and post-Soviet, this exhibition sought to convey the impact Russian Modernism had on the revival of art after the death of Josef Stalin in 1953, and the impact it continues to have to this day. Susan Harbage Page, Trail with Black Plastic Bags, Santa Ana Wildlife Refuge, Texas from the U.S. – Mexico Border Project, 2007. Archival pigment print, 42 x 42 inches (106.7 x 106.7 cm). Collection of the Nasher Museum of Art at Duke University, Durham, North Carolina. Gift of the artist in honor of Emily Kass, 2014.8.3. © Susan Harbage Page. These photographs were selected from the permanent collection by art history and visual studies Professor Patricia Leighten for the fall 2014 class History of Photography. Ranging from the mid-19th century through today, these photographs included a variety of subjects, photographic media, and techniques used by both American and international artists. The works were studied by students over the course of the semester. Lyle Ashton Harris, Blow Up II (Armory) (detail), from the portfolio America: Now and Here, 2005 (printed 2009). Chromogenic print, 23 7/8 × 20 inches (60.6 × 50.8 cm). Collection of the Nasher Museum of Art at Duke University, Durham, NC. Gift of Dr. and Mrs. Ronald Francesco, 2013.15.1.12. © Lyle Ashton Harris. This installation was inspired by Chimamanda Ngozi Adichie’s novel Americanah (2013), the 2014 Summer Reading book for incoming first-year students at Duke. Set in recent decades, this novel follows Ifemelu, a young Nigerian woman, as she experiences school, work, and relationships in both Africa and America. Ifemelu, along with relatives and friends living abroad, navigates the complexities of being a stranger in a foreign land, as well as the frustration, joy, and relief of returning home after many years. The works that were on display reflected a variety of cultures and time periods and explored themes found throughout Americanah, including identity, race, immigration, and American and African cultures. The museum invited viewers to use the works to consider these themes visually. Members of the Duke community from a variety of academic and administrative departments offered their personal reflections on some of the works, which were included in the installation booklet. Henri Toulouse-Lautrec, French, L’Anglais au Moulin-Rouge (The Englishman at the Moulin Rouge) (detail), 1892. Lithograph on paper, 18 9/16 x 14 5/8 inches (47.1 x 37.1 cm). Collection of the Nasher Museum of Art at Duke University, Durham, NC. Bequest of Nancy Hanks, 1983.10.12. Photo by Peter Paul Geoffrion. Cabaret and café-concert culture in late 19th-century France captivated a new public and served as a site for creative exchange between visual artists, musicians, poets, dancers, and theatre performers. Cabarets, or cabarets artistiques, offered a variety of flashy spectacles including singers who performed their own songs, while at café-concerts the audience listened to singers recite popular melodies of the period. Both were awash in alcohol. A companion installation, Cheap Thrills: The Highs and Lows of Montmartre’s Cabaret Culture, 1881-1939 in the Perkins Gallery (February 18 – May 15, 2014) provided an additional overview of cabaret venues and famous performers. These installations showcased important material from the Nasher Museum of Art and the David M. Rubenstein Rare Books and Manuscript Library, such as sheet music, posters, and illustrated periodicals. The auditory experience of the cabaret was reanimated by recordings of traditional cabaret songs newly arranged by Duke’s New Music Ensemble, which was available for visitors to listen to in both installations. This music was also presented live in a series of three performances in the Von der Heyden Pavilion (February 21), Fullsteam Brewery (April 6), and Baldwin Auditorium (April 10). These installations were the result of a collaboration between doctoral students in the Department of Art, Art History & Visual Studies, Alexis Clark, Kathryn Desplanque, Emilie Anne-Yvonne Luse, and Laura Moure Cecchini, and doctoral students in music composition who participate in the Duke New Music Ensemble: Benito Crawford, D. Edward Davis, Timothy Hamburger, Jamie Keersecker, Dan Ruccia, and Vladimir Smirnov. Doris Duke, Fort Sumter, South Carolina, 1930-1935. Photograph. Doris Duke Photograph Collection, David M. Rubenstein Rare Book & Manuscript Library, Duke University. The name Doris Duke is often synonymous with the glamorous yet eccentric and reclusive heiress whose life played out in the press. The archival materials of this installation, which are part of the Doris Duke Collection at the David M. Rubenstein Rare Book & Manuscript Library at Duke University, revealed a much different and more complex story. Adventurous, intelligent, and independent, Doris Duke (1912–1993) was determined not to be defined by social expectations or her vast wealth. Throughout her life she continued her family’s innovative pattern of philanthropy, eagerly advocated for the protection of the environment, and pursued her lifelong passion as both a collector and patron of Islamic art. This installation included documents from Doris’s childhood, audio recordings of Doris singing and playing piano, and reproductions of photographs taken throughout Doris’s life and travels. Andy Warhol, , 1972. Screenprint on paper, 42 x 41 15/16 in. (106.7 x 106.5 cm). Collection of the Nasher Museum of Art at Duke University. Gift of Blake Byrne, T'57. This installation was inspired by Colum McCann’s novel Let the Great World Spin, the 2013 Summer Reading book for incoming first-year students at Duke. Set in New York City, the book follows the lives of several strangers who are all connected by one common experience: the real-life tightrope walk between the World Trade Center towers by Philippe Petit in 1974. As the characters’ lives collide, we are reminded of the interconnectedness of our daily actions, past, present, and future. The artworks displayed reflected a variety of cultures and time periods and explore themes found throughout Let the Great World Spin, including balance, flight, city life, and the war in Vietnam. Members of the Duke community from a variety of academic departments offered their personal reflections on some of the works. Their thoughts were shared in the installation’s accompanying booklets. This installation was organized by Professor Richard Powell’s Art History class “The Black Atlantic” as an educational counterpoint to the exhibition Wangechi Mutu: A Fantastic Journey that was on view at the Nasher Museum from March 21 through July 21. 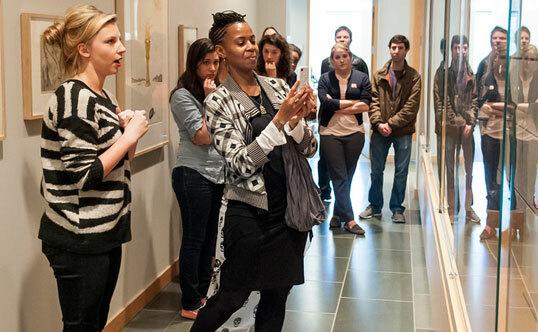 Above artist Wangechi Mutu along with Duke students look at The Black Atlantic installation. These works offered representations of, and responses to, images of power in late and post-Soviet Russia (1970-1995). Focusing on three major institutions of Soviet culture—Communism, architecture, and the media—this exhibition explores the ways in which artists represented, confronted and challenged them through different styles and forms. A number of the selected pieces addressed the Communist Party overtly; Vladimir Lenin, Joseph Stalin, and Mikhail Gorbachev all appear in their most iconic forms. Other works approached politics more indirectly, raising related questions of culture, consumption, and economics. Architecture was represented both as a means to assert official power through the construction of state-sanctioned buildings, and as a means to flout it through the creation of alternative architectural worlds. Finally, whether through the incorporation of newsprint, advertising, or Hollywood film stars, many of these works also addressed the pervasiveness of mass media in Russia during this time. Far from rigid, these categories frequently overlapped in the objects on display. The resulting interplay offered a glimpse of the cultural and political climate of this period in Russian history. This installation was organized by Professor Pamela Kachurin’s class, ARTHIST289, 544/RUSSIAN355, 561: Soviet Art after Stalin. For a second year, the Nasher Museum of Art is collaborating with Duke’s Office of New Student Programs to present an art installation accompanying the incoming freshmen summer reading book. This year’s selection, State of Wonder by Ann Patchett (2011), is a novel that follows an American pharmacologist as she seeks out her former mentor developing a fertility drug in the heart of the Amazon. Over forty art works from the Nasher’s permanent collection, ranging from Ancient American ceramics to contemporary Chinese photography, explore themes such as maternity, bioethics, biodiversity, and post-colonialism. The video above succinctly details the State of Wonder exhibition featuring Molly Boarati, the Nasher Museum’s Assistant Curator, and was produced by Duke’s Office of News and Communications. Students and professors in three Duke classes– “Archaic Greec”e (Professor Carla Antonaccio), “Roman History” (Professor Tolly Boatwright), and “Representing Women in the Classical World” (Professor Sheila Dillon)– used works from the museum’s permanent collection, as material evidence for the cultural production and history of antiquity. These objects came from the two collections of antiquities held by the Nasher Museum. The Duke Classical Collection was begun by Duke’s Department of Classical Studies in the 1960s, and transferred to the university museum in the late 1990s. Most of the collection was published in A Generation of Antiquities: The Duke Classical Collection 1964-1994 by Professor Keith Stanley. The Kempner Collection, given to the museum in 2006 by Dr. Barbara Newborg, is documented in a new catalogue, The Past is Present: The Kempner Collection of Classical Antiquities at the Nasher Museum of Art at Duke University, published in 2011. 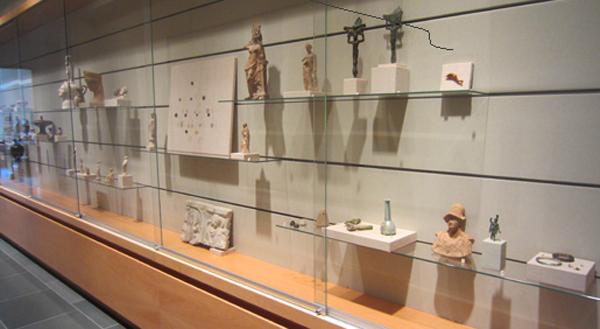 Above is an installation view of Life in Classical Antiquity. The variety of materials, size, function, provenance and dates of these objects illuminated the rich complexity of the ancient world. These objects allowed students first-hand experience with the material remnants of the ancient cultures they study. This installation was organized in conjunction with the publication of The Past is Present: The Kempner Collection of Classical Antiquities at the Nasher Museum of Art at Duke University, a catalogue devoted to classical antiquities given to the museum in 2006 by Dr. Barbara Newborg. Above is an installation view of The Past is Present. This remarkable gift nearly doubled the Nasher Museum’s holdings in ancient art, including classical Greek, Etruscan and Roman works, and greatly enhanced the collection’s quality and variety. The Kempner Collection provides a broadened range of classical objects allowing the museum to serve its varied audiences. Duke students and faculty studying ancient art can do so at a much higher level than before. The collection also enriches the experiences of our visitors, including K-12 students, community members and visitors. Rosa Bonheur, A Group of Six Sheep (detail), 19th century. Graphite on paper, 9 3/8 x 11 ½ inches. Collection of the Nasher Museum of Art at Duke University. Gift of George and Alice Welsh, 2001.15.5. For the first time, the Nasher Museum is collaborating with Duke Summer Reading and Duke Reads Online Book Club. This installation was in the museum’s education gallery and presented more than 30 works relating to Jonathan Safran Foer’s book Eating Animals. The installation challenged visitors – whether carnivores, omnivores, vegetarians or vegans – to think about what eating meat means to them. It included works in a variety of media spanning more than 2,000 years.